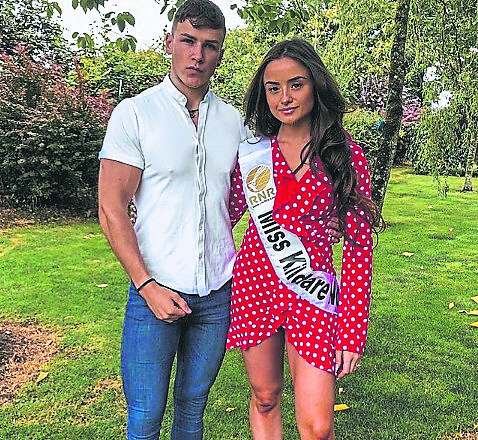 Twenty-two-year-old Keelin Nugent from the Curragh will represent the Lilywhite county in the Miss Ireland contest this weekend. A final year student in Sports Science and Health in DCU, Keelin is a fitness fanatic along with boyfriend Craig O’Sullivan, who is Mr. Cork. “I kind of got into it last minute, I did not think I was going to get in. They messaged me through my social media and asked me did I want to go in as a wildcard. So I did and now I have the title Miss Kildare”, Keelin told the Leader. Keelin has been busy fundraising over the last few weeks. “I’ve been affiliated now with LauraLynn, so I’ve been fundraising for them the last few weeks and we’ve made €1,500 in the last week. We’ve just got such a great community here, and they really support us so we had afternoon tea, and literally every single granny from around the place came out in force, it was genuinely lovely,” said Keelin. She is now busy preparing for the big night in the Helix, DCU this Sunday, September 16. Keelan’s boyfriend Craig is also hoping to crowned Mr. Ireland on Sunday. “We practice together and I know if I was doing it by myself I would drive him mental with the stress”, Keelin laughed. Keelin and Craig both have a massive interest in fitness. Some 32 girls will battle it out in the Helix this weekend. Keelin is very proud to be representing her county. “It literally means the world to me. I went to an all girls boarding school, so I was always surrounded by opinionated, intelligent women. I just literally want to be that for women. I feel like everyone puts themselves down. I want to be like that saying you can do whatever you want, it doesn’t matter if you’re a girl. Keelin says after the competition she wants to keep fundraising and raising awareness for the LauraLynn Foundation.